I never really know what to call these, but we sure print a lot of them! We take a picture, blow it up to big size, print on gator board, and cut it out. 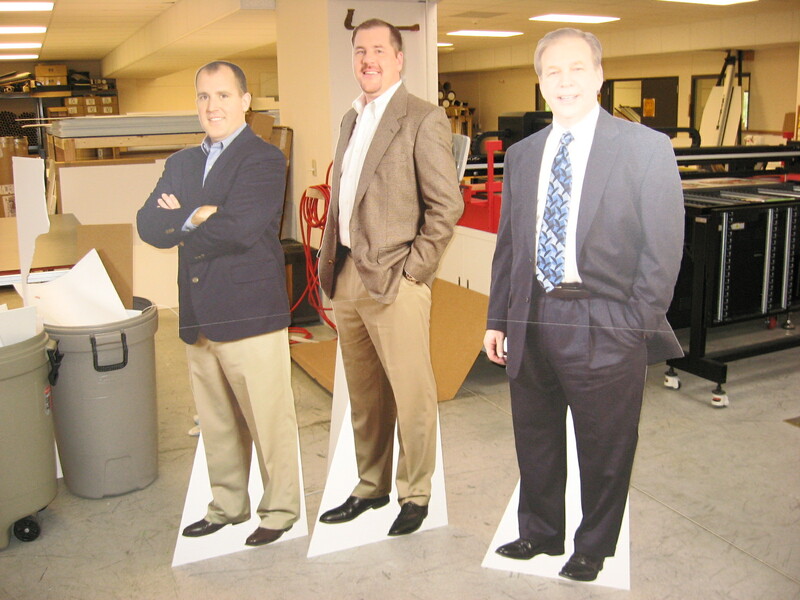 We call them People Cutouts or Life Size Stand Ups. Or maybe People Standups or Life Size Cutouts. It gets to be a bear to find them on the internet, but people do! We put an easel stand on the back so they stand up. And they ship folded in half so the Fedex is affordable. As you can see at the right, the seam that creates is just about invisible. There are also some tricks to doing them. As you can see, we need something level on the bottom so they are stable. We also need to fit into a 3×6′ envelope, so they can’t be holding a hockey stick! If you want to buy a cardboard figure of Elvis, you can probably get one at a novely store for $20. That’s because they made 10,000 of them. A single cutout goes for $199 plus the shipping to you. This entry was posted in Flatbed printing and tagged cardboard people, cutouts of people, life size standups, people cutouts. Bookmark the permalink.